In the short recoil system of operation, the barrel and bolt remain locked and recoil together for a short distance until the powder gas pressure has dropped to a safe limit. The recoil movement is then utilized to unlock the bolt and after unlocking, the barrel is stopped while the bult continues to move to the rear until the opening between the barrel and bolt is sufficient to permit feeding. 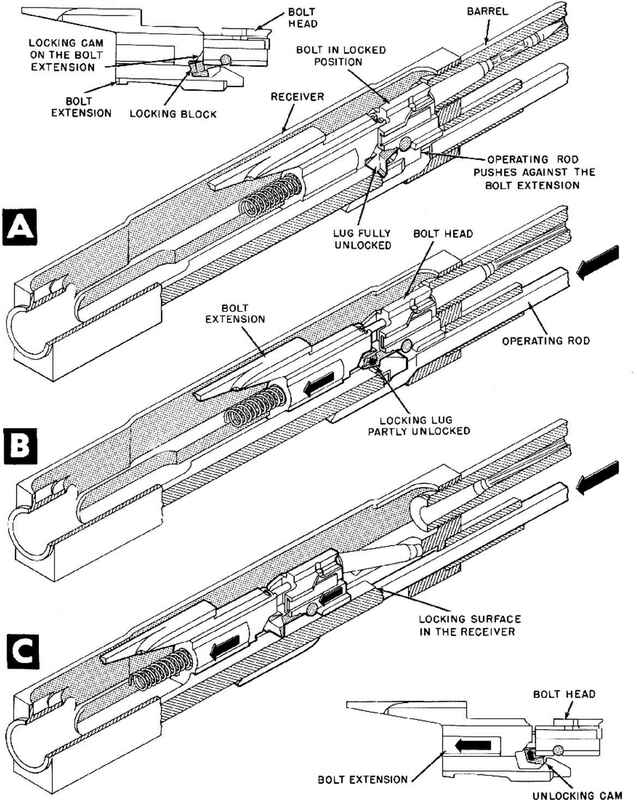 It would be possible for the bolt to complete this movement merely by virtue of the momentum it possesses at the instant of unlocking, but in all short-recoil weapons, in order to speed up operation, the bolt is given additional momentum by means of an accelerating device which transfers energy to the bolt from the barrel during the short time that the barrel is still moving to the rear after unlocking. Also, unlocking usually occurs before the residual pressure reaches zero and therefore the bolt receives an additional impulse from blowback action. in fig. 2-14A. These elements consist of the bolt, an arrangement for locking the bolt to the barrel and for unlocking it, an accelerating device, a barrel stop, a backplatc buffer, and springs for returning the barrel and bolt after recoil. In the mechanism illustrated, the barrel is latched in the position at which it is stopped after unlocking. The returning bolt unlatches the barrel before the bolt locks to the barrel extension and then the barrel and bolt return to battery together. In other weapons, the barrel may be returned to battery independently before the bolt returns. The other portions of fig. 2-14 show different stages during the cycle of operation. ing spring and barrel spring is relatively small so that the only really significant factor in limiting the recoil acceleration is the mass of the recoiling parts. The large forces exerted by the peak pressure of the powder gases exist for a relatively short time. In a typical 20-mm gun with a barrel length of about five feet the projectilc leaves the muzzle 0.008 or 0.009 second after ignition of the primer. However, 0.001 or 0.002 second after the projectile leaves the muzzle, the residual pressure has dropped to a safe limit and the bolt may be unlocked in order to take advantage of the blowback action produced by the residual pressure. Therefore, at this instant, the unlocking device is actuated to free the bolt from the barrel (fig. 2-14B).